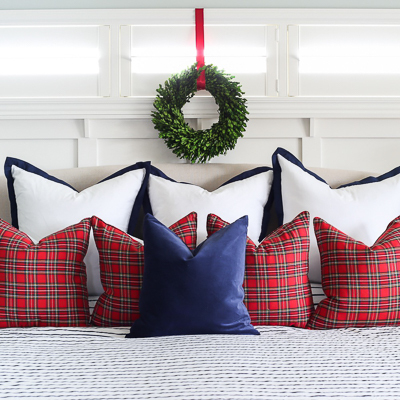 Welcome to our Deck the Halls Home Tour – Master Bedroom edition! 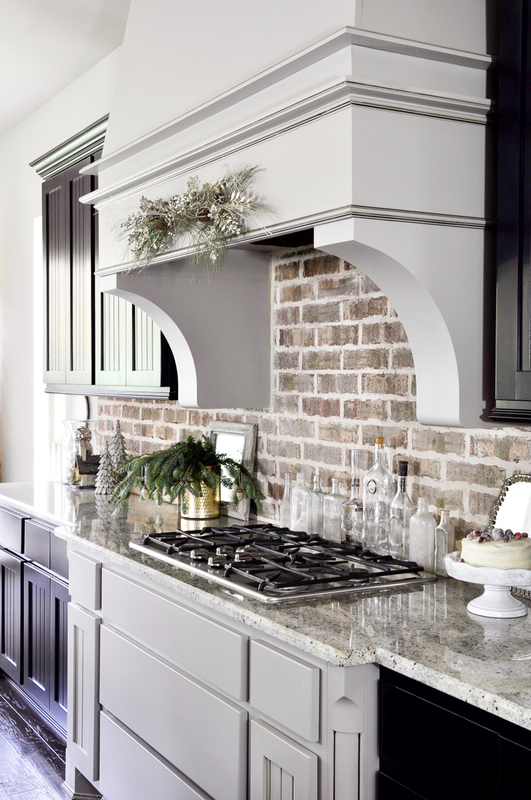 If you have come from French Country Cottage, a special welcome to you! Courtney is incredibly talented. I just adore her dreamy, romantic style. After the kitchen and family room, I would presume that most of us spend most of our time in our master bedroom. 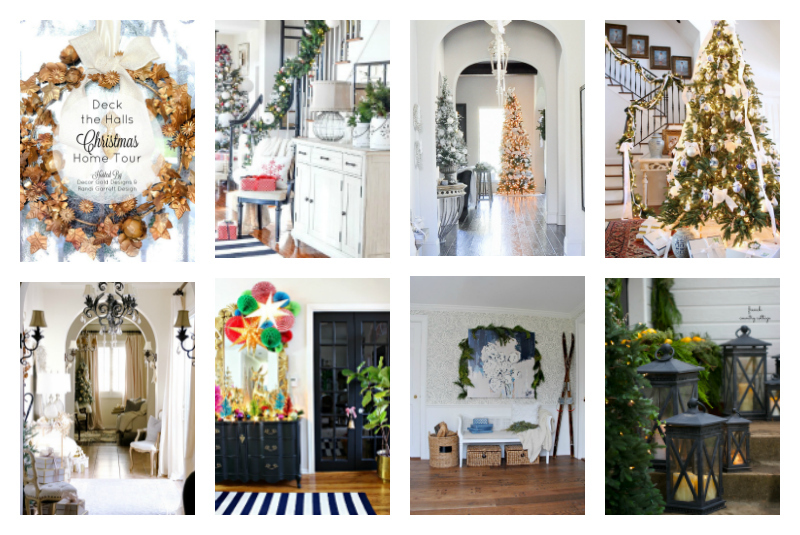 Why not decorate it for Christmas as well? So, last year, I decided to decorate it for the first time. Now, a new tradition has been born! This year, I wanted a classic, understated elegance for our bedroom. 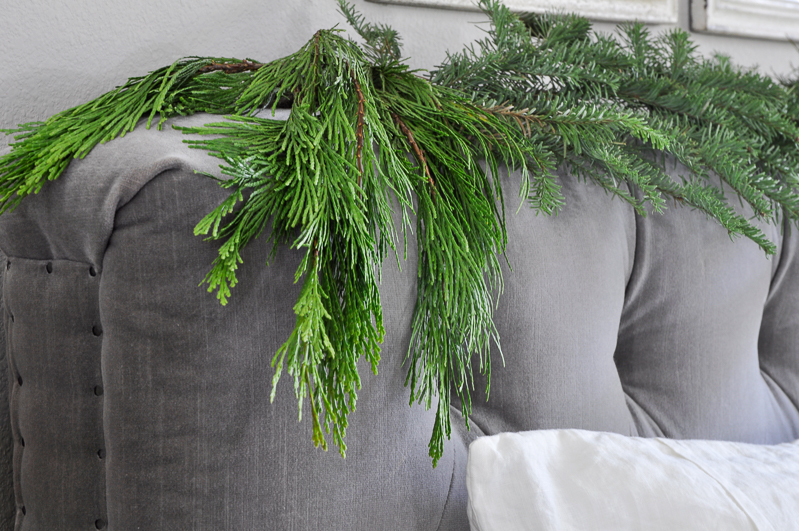 A soft glow of the tree combined with the subtle scent of fresh pine greenery is one of the primary visions I had. Let’s check out the final results, shall we? 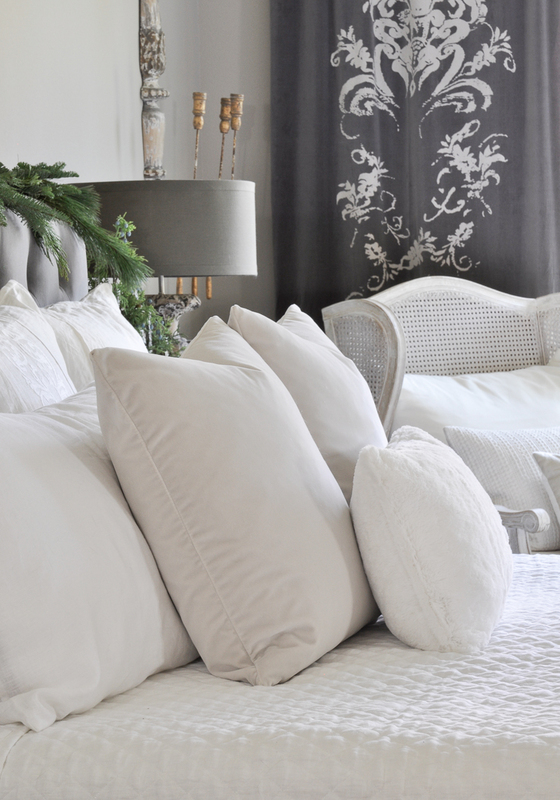 For the bedding, I opted for a luxurious, classic collection in snowy white. 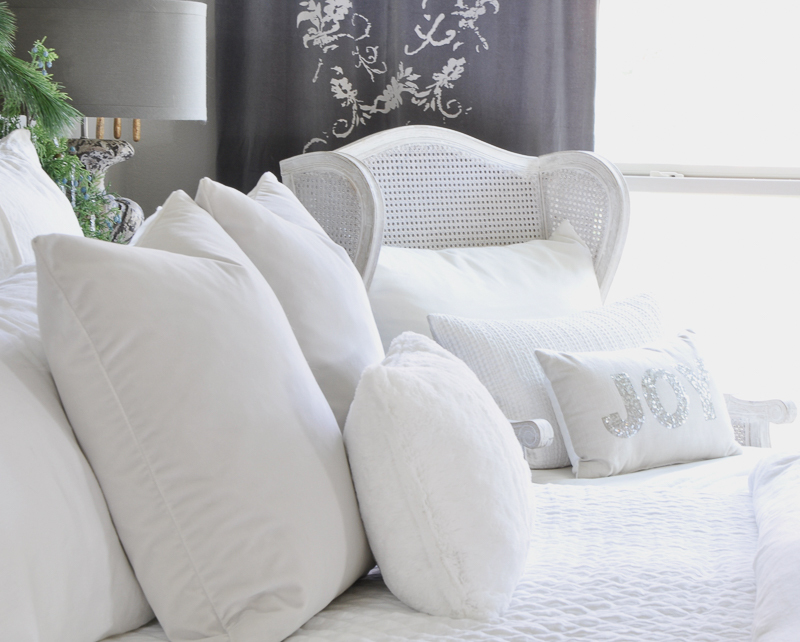 Wanting to keep the consistency with the white theme, the chaise lounge is layered with multiple pillows. 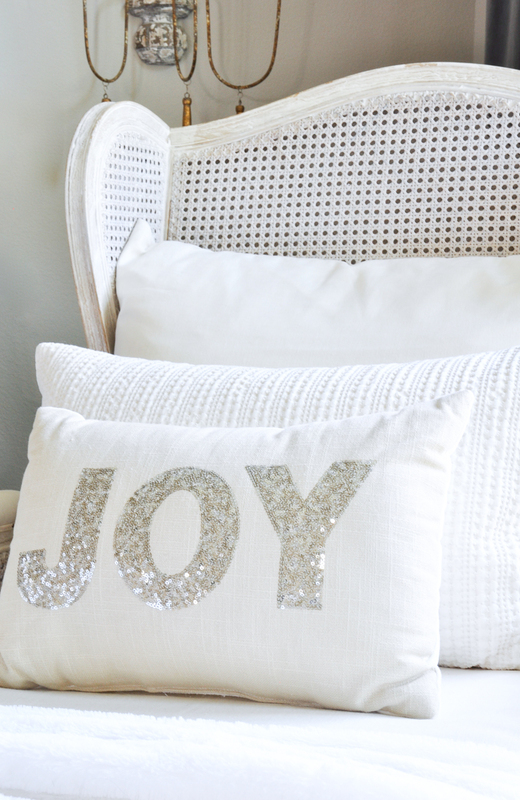 My little “Joy” pillow adds a touch of Christmas spirit to the bedroom. This chaise lounge has been a favorite spot of mine since we purchased it. 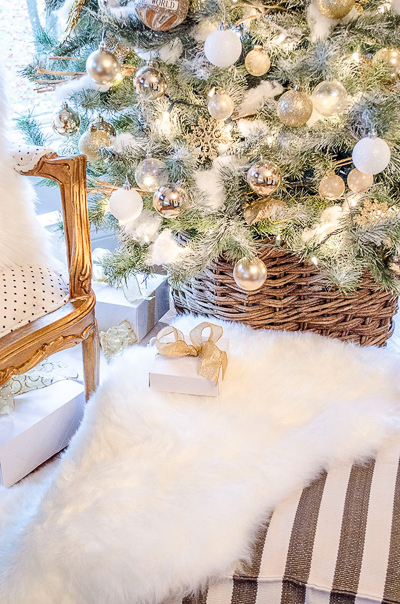 The cozy white throw is just a perfect addition this time of year. 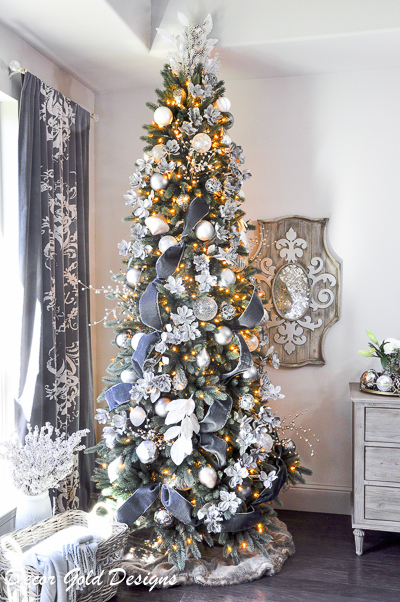 Wanting to pull the charcoal gray color from the curtains, I found this gray velvet ribbon which has to be the shining star of this tree. It accents the silver and white while making the look a bit more unique. 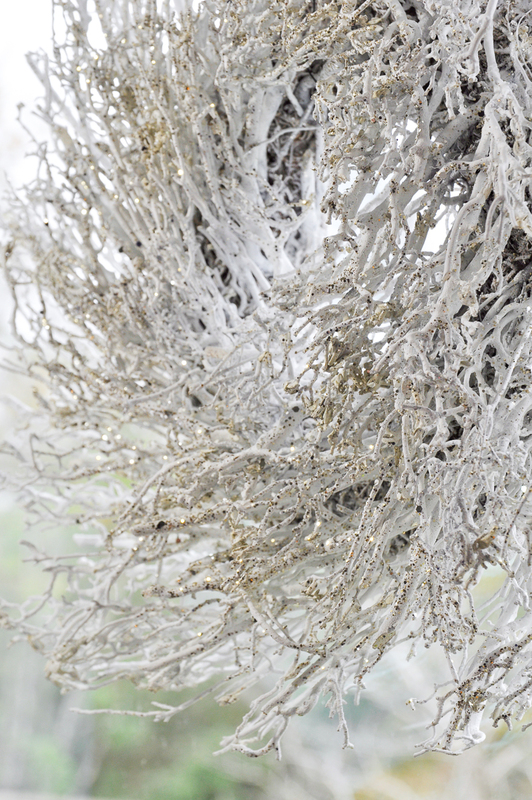 (You can read more about my tree here). 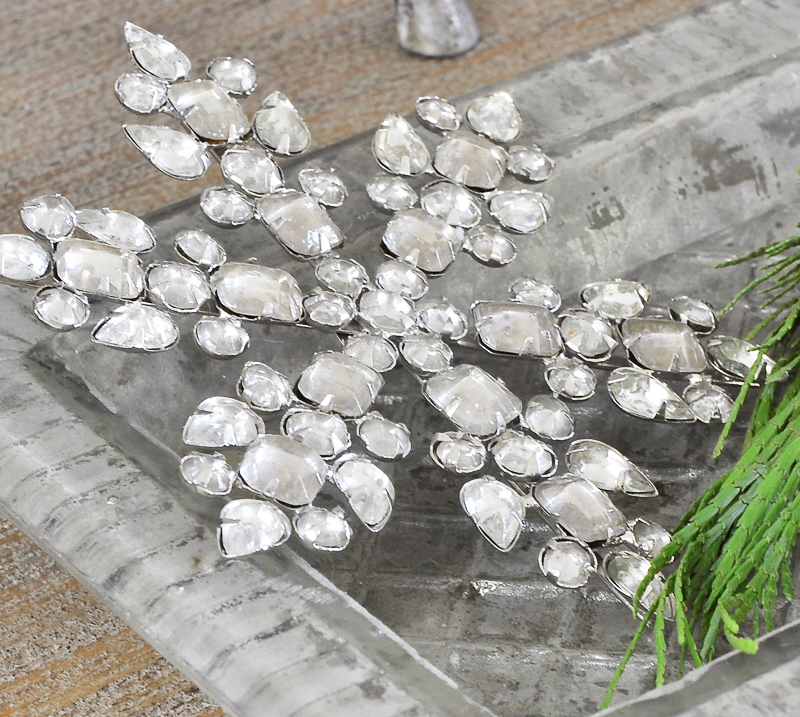 If you look closely, you can see the glittery silver magnolia picks were placed in rows. This view of the bedroom from the en-suite also looks out toward a forest. Our trees look more like fall than winter, but I still enjoy seeing our Christmas tree and natural trees at the same time. 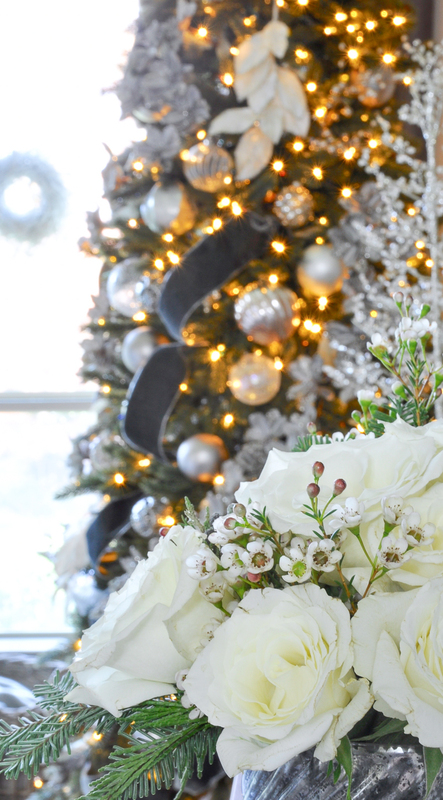 The white snowy wreaths on the window are made of twigs and dusted with a light layer of gold glitter. 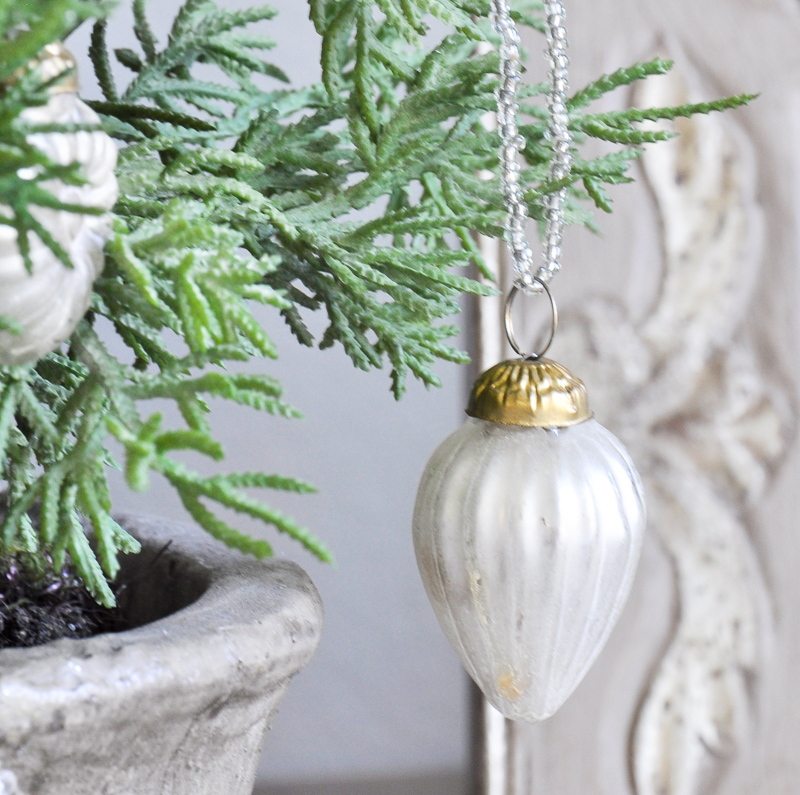 I added a larger one above my fireplace and loved it so much, I went back for three more. 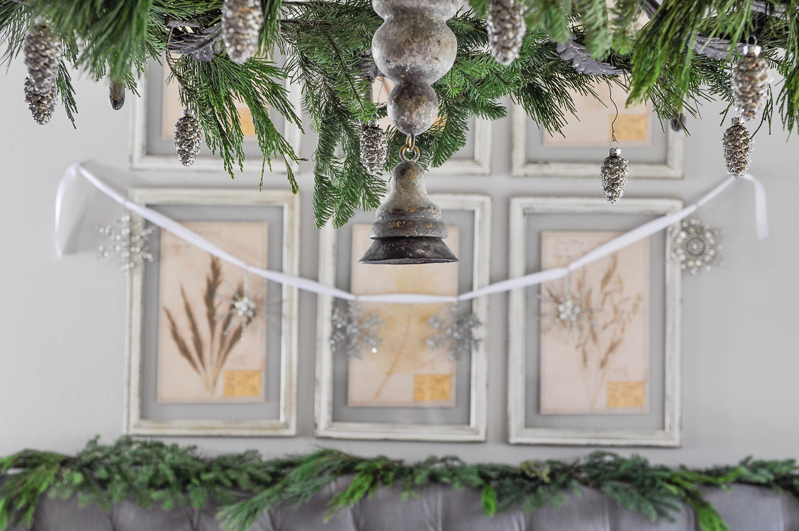 Wanting to keep it natural this year, I added fresh garland along the headboard as well as the chandelier. 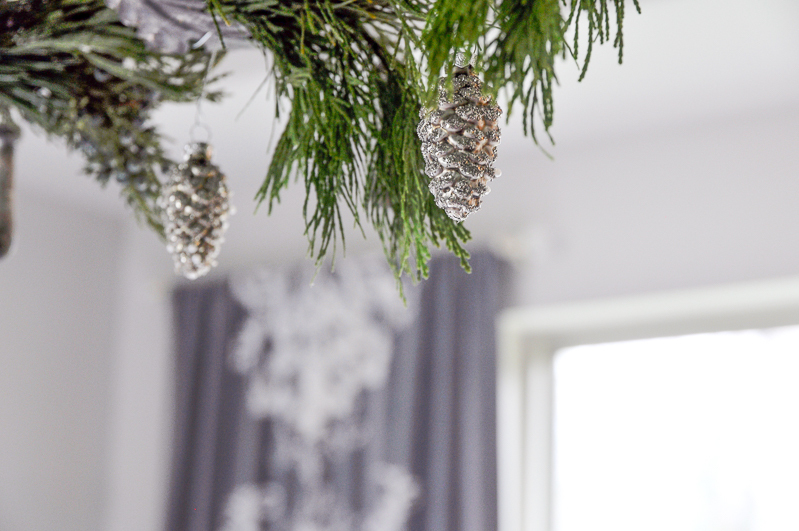 The frosted pinecone ornaments added to the fresh greenery are a lovely accent which provide balance to the lighting fixture. 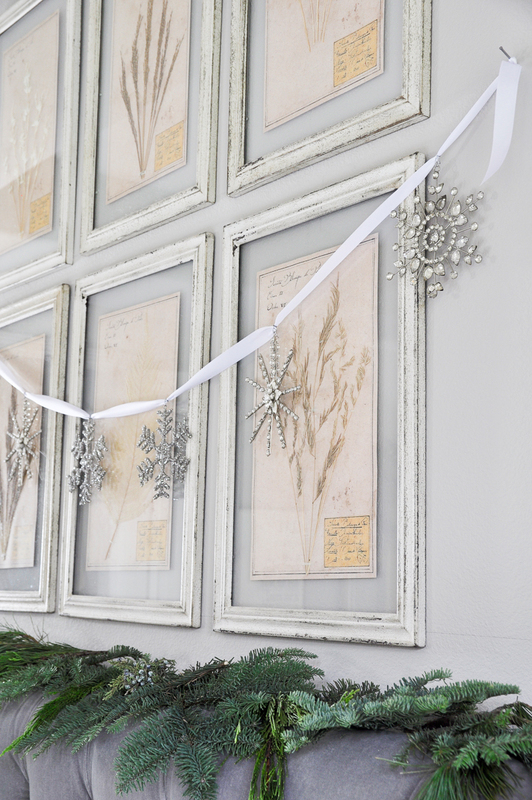 For a simple shimmery addition above the headboard, I clipped crystal snowflake ornaments to a ribbon. In this room, the green, white and silver palette extends to the nightstands not only for continuity, but balance as well. 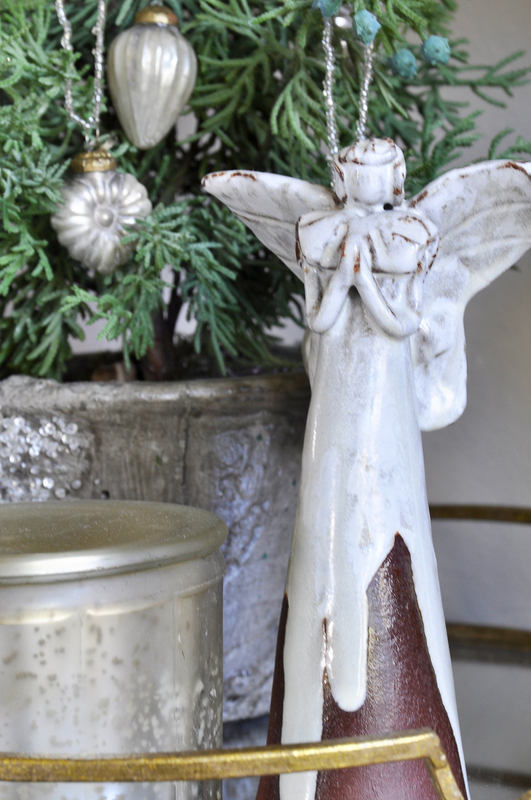 The ornaments, angel and ceramic pot draw just the right amount of attention from the grander pieces. 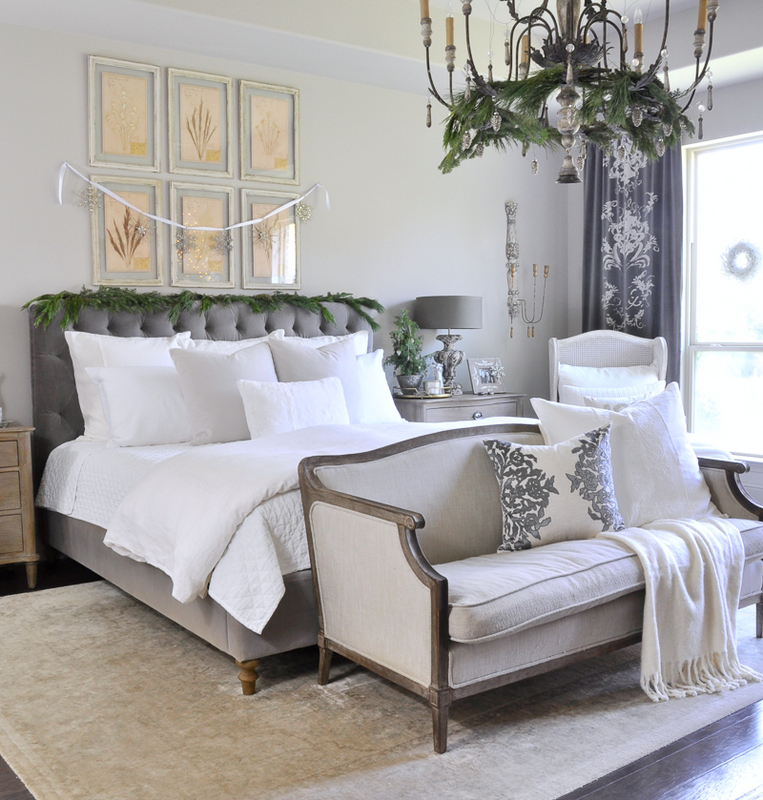 Is this the year you decide to decorate your master bedroom for the first time? You’ll be so glad you did! 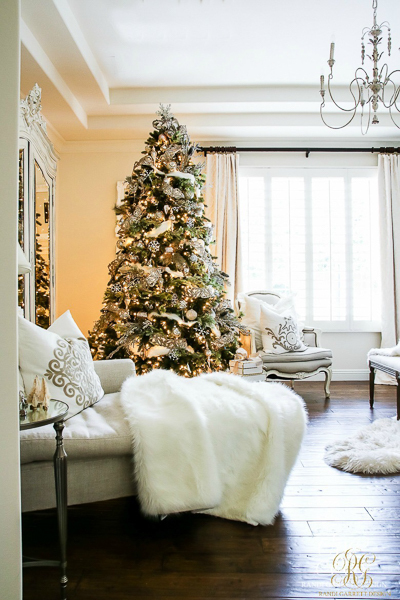 Our evenings spent in this room with our pups beside the soft, warm glow of the tree are nothing short of memorable. 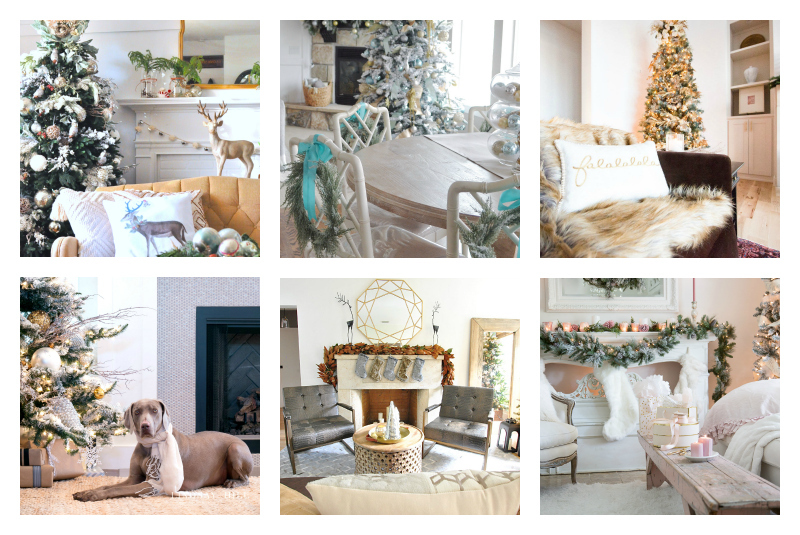 Hopefully you enjoyed this Christmas tour of my master bedroom. As always, thanks so much for spending some of your time here with me! Next stop Life on Virginia Street. You don’t want to miss it! Your bedroom is beautiful. 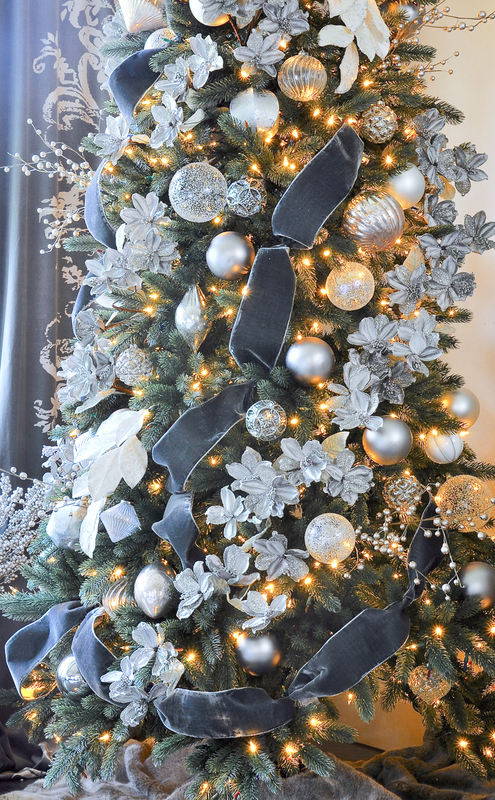 I agree about the grey velvet ribbon, it caught my eye right away, and it is the shining star of your tree! Thank you! It’s so great to find something unique! So glamorous and elegant, Jen! 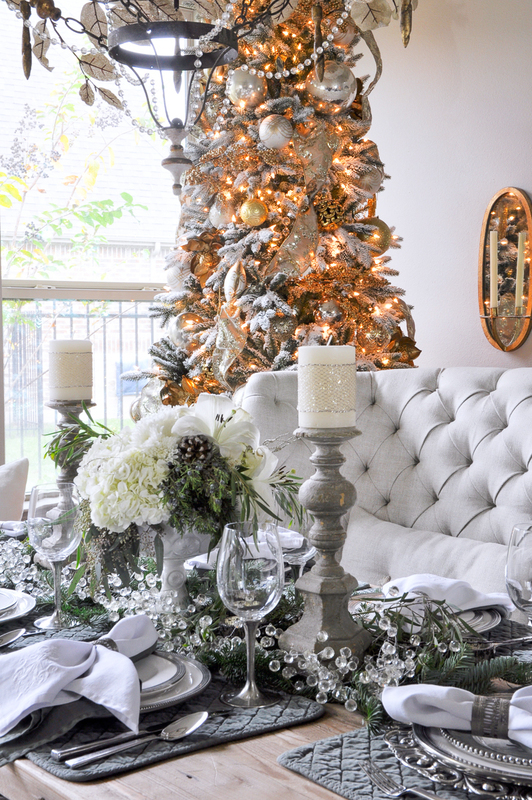 I love that velvet ribbon in your tree, and your pretty touches of greenery! Thanks so much for inviting me to participate in this tour with all these talents friends! Hope you have a lovely Christmas! Thanks so much Kathleen! I hope your Christmas was fabulous! You are so sweet Randi! So glad we got to do this tour together. It really was so much fun! Thanks so much Annie! 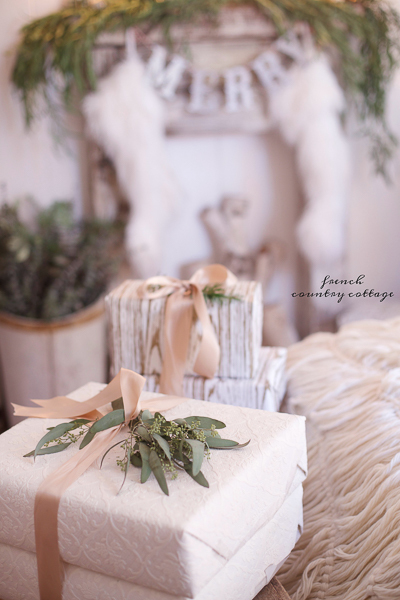 I hope you had a wonderful Christmas!!! 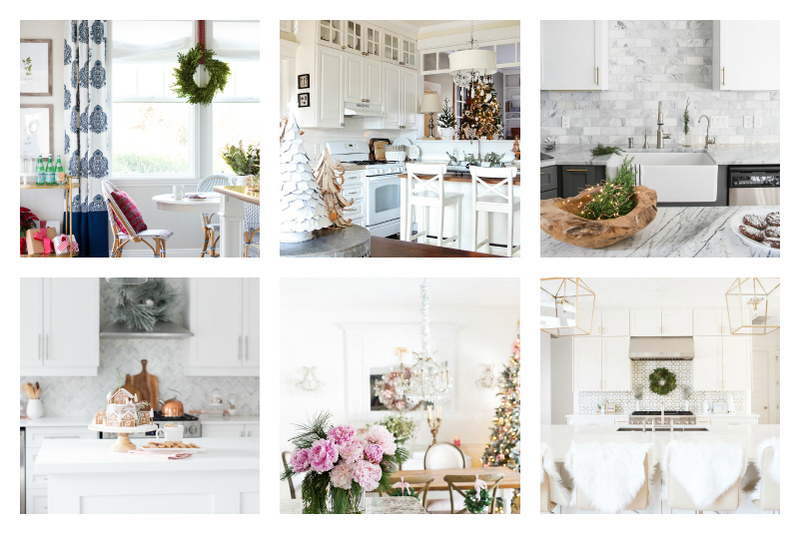 Such a gorgeous space, Jennifer! I LOVE that tree! 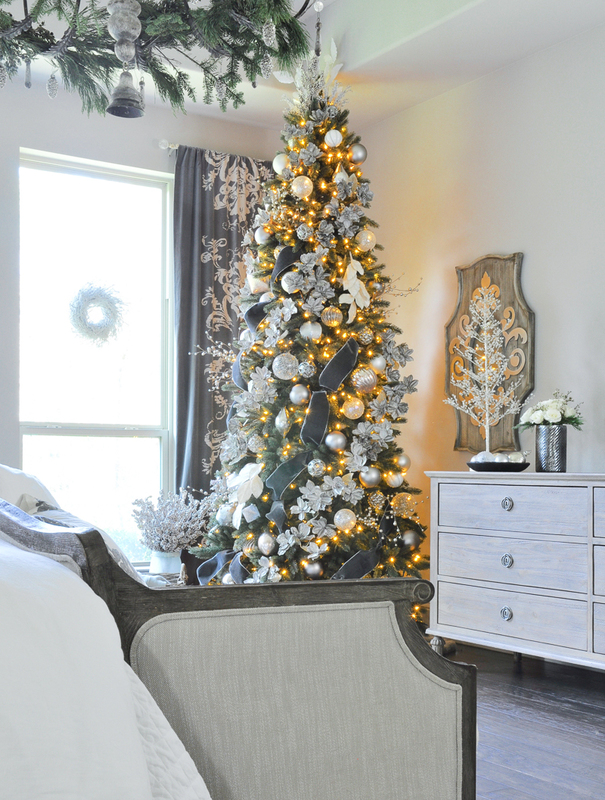 I’ve never done a tree in our bedroom, but next year I may have to! 🙂 Thank you so much for organizing all of us! Have a very Merry Christmas! Thank you so much Abby! I highly recommend a bedroom Christmas tree. We love ours. 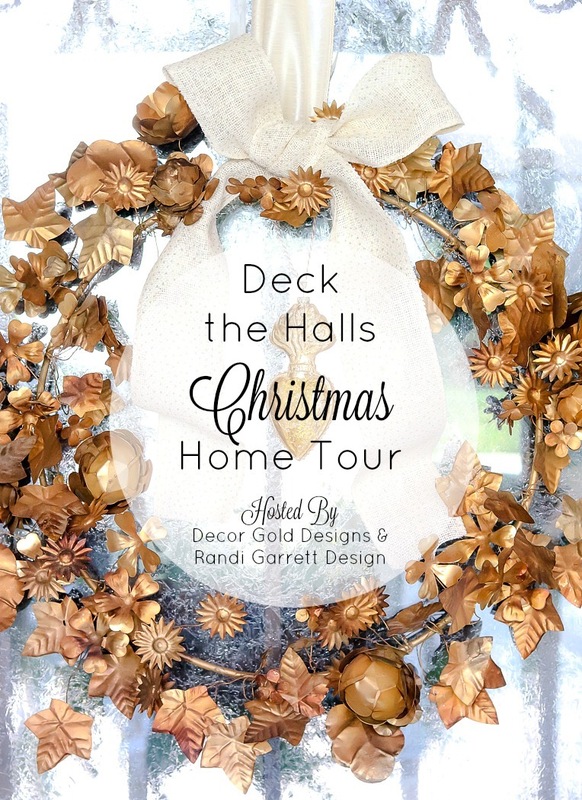 I hope you had a wonderful Christmas and I’m so glad you could join us for this fun tour! 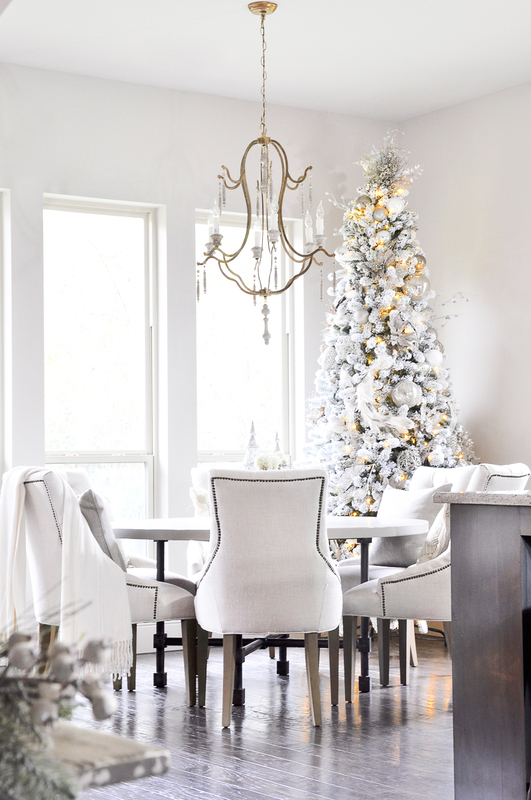 That gray velvet ribbon on your tree has me swooning! The whole room is stunning. Thank you so much Julie! I knew I had to have it the moment I saw it! 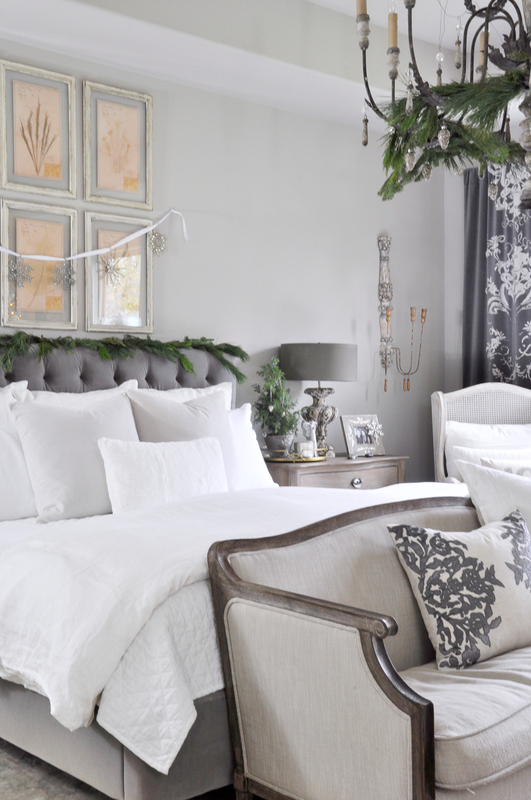 Jen, I love your Christmas bedroom and I especially love the snowflake ornaments strung by ribbon above your bed! Such a nice touch!! Merry, merry!! Thank you so much sweet friend! 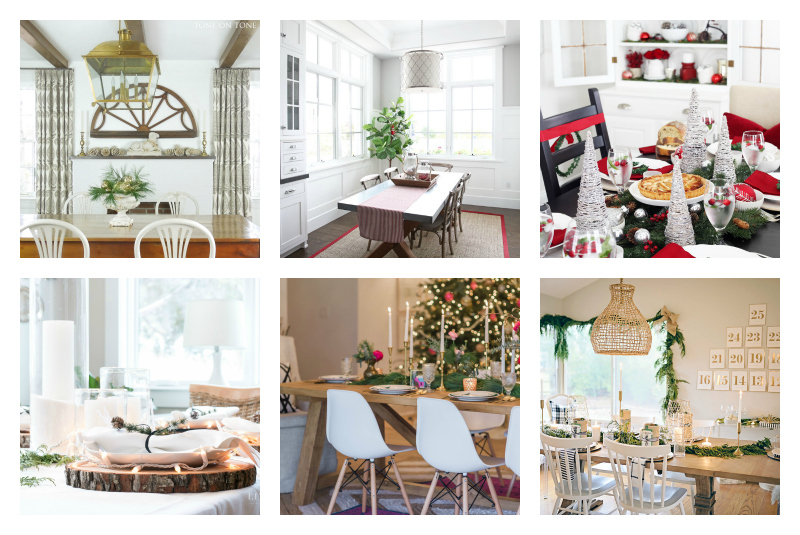 I have loved seeing every room in your beautiful decorated holiday home!